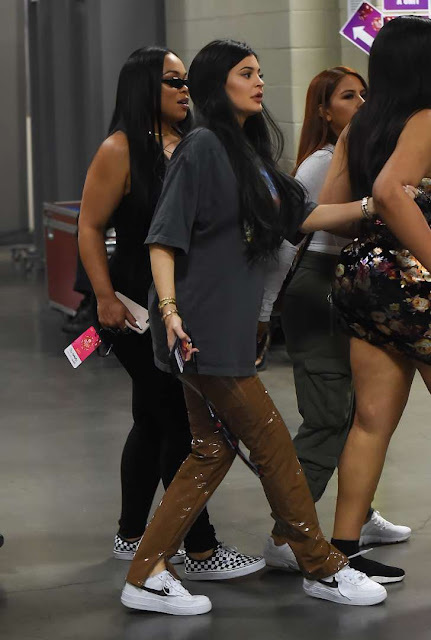 The day after multiple outlets confirmed that 20-year-old Kylie Jenner is pregnant, the reality TV star and beauty businesswoman stepped out wearing a baggy shirt that covered up her growing baby bump. Kylie was photographed wearing an oversized gray T-shirt, shiny brown PVC pants and white Nike sneakers on Sept. 23 as she and a group of friends walked around backstage at the iHeartRadio Music Festival in Las Vegas. 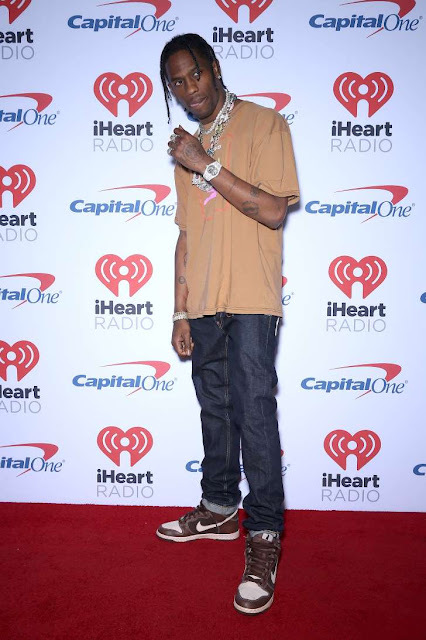 She was there to see her boyfriend of five months, 25-year-old rapper Travis Scott (real name: Jacques Webster Jr.), perform at the T-Mobile Arena along with DJ Khaled, Chance the Rapper, Demi Lovato and French Montana (who, coincidentally, once dated Kylie's big sister Khloe Kardashian). After taking the stage with Khaled, People reports, Travis went backstage, where he was seen hugging Kylie, before heading to Hakkasan nightclub to perform again later in the evening. According to People, the "Keeping Up with the Kardashians" and "Life of Kylie" star is expecting a baby girl in February. A source close to the family previously told the mag of Kylie' pregnancy news, "It is an unexpected but completely amazing turn of events that she could not be more excited or thrilled about. Everyone is overjoyed for her. This is the happiest she's ever been." But just one day later, People reported that an insider had confessed that some family members are not exactly over-the-moon for Kylie, who was first linked to Travis in April after they were spotted at Coachella and an NBA game. "Kylie is very naive," the insider told the mag. "Spending time with other people's kids is obviously completely different than being a mom 24/7. Kylie of course has no idea about all the hard work and sleepless nights." The same day, Sept. 23, family matriarch Kris Jennerspoke out about the pregnancy reports. "I just woke up this morning. She's not confirmed anything," Kris told The Cut while at Milan Fashion Week. "I think it's kind of wild that everyone is just assuming that that's just happening." But curiously, Kris did not deny the news either. Kylie and Travis have yet to comment.